My title may not sound as though it fits into the Connected theme, so I’ll explain! My husband and I are from different ends of the country and in the early days we had to travel to meet one another, but we also wrote to one another frequently. These were our methods of connecting, and this is what I wanted to depict in my piece. 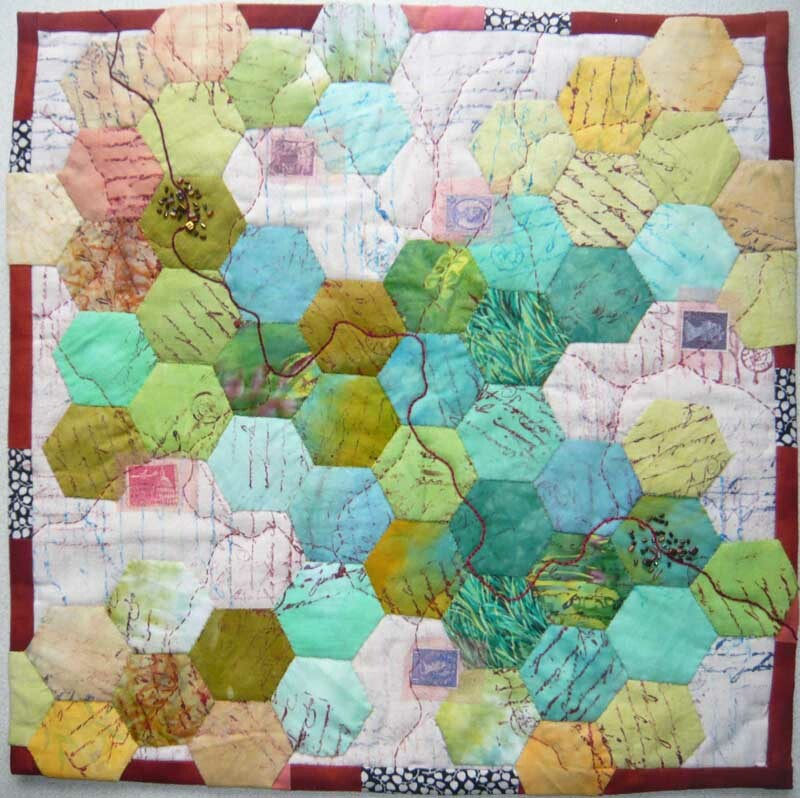 I chose to use English patchwork hexagons, because their interlocking geometric shapes speak to me of connecting. I also wanted to give the feeling of looking down on the landscape from above (almost like looking at a map, or looking down from a plane), so I chose greens and browns for the hexagons in both hand dyed and commercial fabrics. I also wanted to include a reference to our letters, so I chose a plain calico for a background, which I stamped with fabric paint using a rubber stamp which hints at handwriting. I used the same stamp on the hexagons and left gaps between the hexagons so that the calico is visible beneath. I added a few old stamps to further hint at letters. I tried to keep the feel of looking down on a landscape or map, by using beads to depict our two towns at either end of a couched red cord ‘road’, and adding other ‘roads’ in red running stitches, which also give some additional quilting lines. An interesting interpretation, Joan. 🙂 I very much like the hexagon “map”, the beading to show the wee towns, and the impression of hand-written letters. I love your idea Joan, the writing on the hexagons, the stamps and the curly roads : it is just looking at England when we arrive by plane !